Official USAV licensed product. Design allows for rotation tracking of two teams simultaneously. 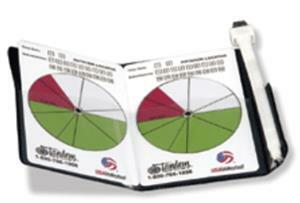 Pocketsize for easy handling, tracks rotations, substitutions, positions, and timeouts. Includes a dry erase marker and a handy carrying case. Measures 4.5" x 3", increases to 6.5" when case is fully extended.